As promised, the Theatre Scene has kept a tally of shows and reviews. We included a total of 12 shows in our tally: we specifically excluded tours and shows in foreign languages. We have kept it to the mainstream, so that all the papers can be compared on something approaching a level playing field. We also excluded reviews not written by the source's acknowledged critic, or that appeared first in another source. A theatre review is not general news; it's opinion. A theatre critic is the "voice" for their paper, and that voice must be consistent, which means it must be the same person each and every time. It is a failing of area editors that they still don't understand this glaringly simple concept. 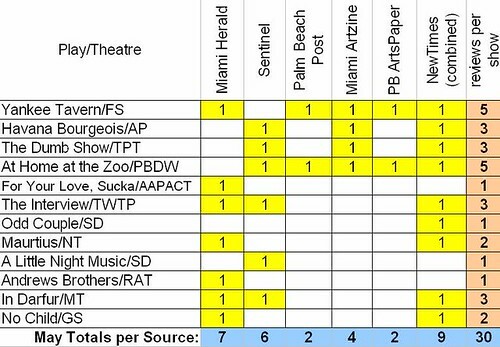 As you can see, the Herald and the Sentinel are very close in the number of shows they cover, about half of what's playing in South Florida at any given time. The Palm Beach Post as the most pathetic coverage of any so-called "major" paper in South Florida. Surprisingly, the dailies were beat by a free weekly - the New Times. Now there are two editions of the New Times in South Florida; the Miami New Times, and the Broward/Palm Beach New Times. But they share a singly theatre critic, and even considering he's in both editions, that gives him a maximum of eight issues to appear in, versus 30 or more for the "Big Three." And yet Brandon still managed to get 9 reviews out over Christine's 7. Brandon K. Thorp is therefore South Florida Theatre Scene's Most Prolific Reviewer for May 2009.